Abu-Ghazaleh sponsors Annual Arab Women Media Center's ceremony titled "White Hands in Jordan and Palestine"
Amman - In celebration of the 'Arab Woman Media Day', the Arab Women Media Center organized, in cooperation with Talal Abu-Ghazaleh Knowledge Forum, its annual celebration under the title "The White Hands in Jordan and Palestine" under the patronage of His Excellency Dr. Talal Abu-Ghazaleh and in the presence of the guest of honor Archbishop Atallah Hanna, Archbishop of Sebastia of the Greek Orthodox in Jerusalem. 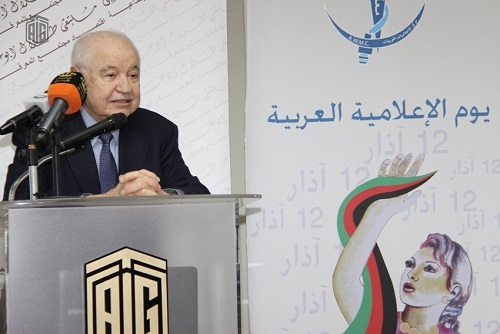 At the beginning of the ceremony, Dr. Abu-Ghazaleh said, "We all know that the Arab world was targeted by physical and moral destruction planned by the Zionist enemy and that this has led to an overwhelming feeling of frustration especially among the young generation that constitutes the bulk of our nation. From here, I urge our Mass media to pay attention to the dark ages that Europe had experienced for decades, not years, and then came the renaissance ". 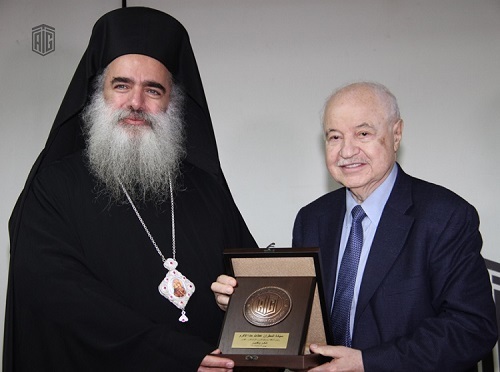 Abu- Ghazaleh added, "Our nation with its history, geography, and leadership of the world for centuries will emerge with the lights of the Arab renaissance that I expect to arise in 2021 after the global recession in 2020 and the resulting wars which will inevitably end with a global recovery emerging from our Arab world". 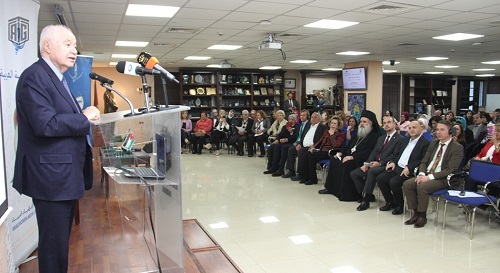 For his part, Archbishop Atallah Hanna, the Archbishop of Jerusalem, expressed his happiness at participating in the ceremony honoring the Arab Women's Day, affirming his pride at the steadfast unitary and cultural efforts and initiatives made by Dr. Abu-Ghazaleh towards the Palestinian cause. He stressed the role played by Arab Media Women in Jordan and Palestine in highlighting the fairness of the Palestinian cause, highlighting the cause of Jerusalem and the fierce attack to obliterate its identity and to Judaize it, pointing to the firm stance towards the Hashemite custodianship of the Islamic and Christian sanctities in Jerusalem and the role of His Majesty King Abdullah II Ibn Al Hussein in protecting these holy sites. The journalist Mahasen Al-Imam, the founder and chairman of the Arab Women Media Center, stated that since its establishment 20 years ago, the Center has raised the slogan "Together" towards an advanced media strategy aimed at serving media women in the Arab world through an annual conference that has been in progress for 15 years, and through a number of training courses for both genders in Jordan and the Arab countries, in addition to many studies that shed light on women’s issues in Arab society to eliminate injustice and discrimination and amend unfair laws against them, and to enhance the dissemination of culture and democratic behavior through youth meetings in various Jordanian universities. Ms. Al-Imam added that the Center has issued and produced many documentaries and training publications supported by caricatures and drawings by the late Arab artist Jalal Rifai. The ceremony was attended by 150 media journalists of both genders from Jordan and our branches in Palestine, Iraq, the Sudan, Yemen, Egypt, and finally in Lebanon who were honored. Ms. Al-Imam appreciated the role of the national institutions supporting the Center and extended her tribute to the Palestinian Media women and their role in supporting Palestinian women and their steadfastness and determination to confront the occupation. She also saluted the Jordanian women who are distinguished for their efforts as creative pioneers, their determination and self-confidence that led them to become creative. During the ceremony, five Palestinian Media women were honored, namely Reem Dahoodi from Voice of Palestine Radio; the documentary filmmaker Imtiaz Al-Maghraby, Maysa Abu Ghazala, a journalist in Ma'an News Agency, Amal Marar, a correspondent in Sharjah TV Channel; and Zeina Sandoka, media reporter in Roeia Channel. In addition, there were 9 distinguished Jordanian women honored, namely Ms. Maysar Al-Saadi, President of the Development Families Association; Ms. Reem Nazzal, Director of the Chocolate Factory; and a group of female entrepreneurs, namely Ms. Safa Zamili, Ms. Fatima Manasra, Ms. Iman Badr, Ms. Lubna Al-Qaisi, Ms. Hunaida Dirani; as well as a group of factory workers, namely: Ms.Samira Fawzi and Fatima Al-Anza from the electronics factory. The honoring shields were handed to the sponsor of the ceremony HE Dr. Talal Abu-Ghazaleh, guest of honor Archbishop Atallah Hanna, the Archbishop of Jerusalem, and the honored Palestinian Media women and distinguished Jordanian women at a ceremony attended by a gathering of representatives of civil society organizations and media professionals from various media organizations.